A Chinese admiral advocated sinking US aircraft carriers in a December speech. While he's not a member of the government, his comments come as the US and China are locked in a trade war and a protracted dispute over Beijing's claims in the South China Sea. China's technological advances threaten the US Navy's effectiveness in the disputed waters near China, a reality the Navy is looking for ways to counter. As China and the US continue to spar over trade and the South China Sea, a Chinese admiral made a bold threat that would eliminate one of the US's primary military advantages, its aircraft carriers - a gaping vulnerability that has concerned US officials as China's military power grows. "What the United States fears the most is taking casualties," Rear Adm. Lou Yuan reportedly said in a speech at the 2018 Military Industry List summit on December 20, adding that sinking one carrier could kill 5,000 US service members. "We'll see how frightened America is," he said. Lou, the deputy head of the Chinese Academy of Military Sciences, has academic military rank and does not command troops, but he has gained attention for his hawkish views on the US, as have other officials who've called on Beijing to take a more confrontational approach. Lou said current US-China tensions were "definitely not simply friction over economics and trade" but rather over a "prime strategic issue," according to Australia's News.com.au, which cited Taiwan's Central News Agency. The US has "five cornerstones" that can be exploited, he said: its military, its money, its talent, its voting system, and its fear of adversaries. China should "use its strength to attack the enemy's shortcomings. Attack wherever the enemy is afraid of being hit. Wherever the enemy is weak," he said, according to News.com.au. Lou said China's new anti-ship ballistic and cruise missiles were able to hit US carriers despite the "bubble" of defensive measures that surround them. The US has undertaken freedom-of-navigation exercises in the area to assert the right under international law to operate there - moves that have provoked close encounters with Chinese ships. Beijing's development of ballistic missiles - like the DF-21, which can reach Taiwan, Japan, and South Korea, and the longer-range DF-26, which can reach most US bases in the Pacific - along with air-defense systems and a more active navy have led to discussions about what the US Navy needs to do to operate in a contested environment, where even its all-powerful aircraft carriers could be vulnerable to attack. In analyses done by the Center for Strategic and Budgetary Assessments, "we determined that if the Navy pursues a lot of the air-defense capabilities that they've been talking about, and some of which have been in development or fielded, they should be able to dramatically improve the carrier strike group's air-defense capacity," Bryan Clark, a senior fellow at CSBA who previously worked on Navy strategy as special assistant to the chief of naval operations, said in December during a presentation at the Heritage Foundation. 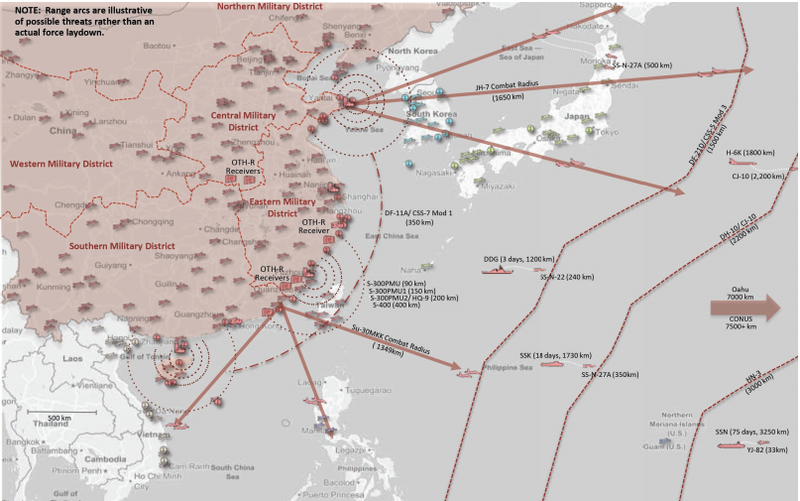 At present, Clark said, carrier strike groups operating about 1,000 nautical miles from the Chinese coast using air-defenses assets like interceptor missiles, electromagnetic jamming, directed-energy weapons, and patrol aircraft can expect to hit about 450 incoming weapons, less than the at least 600 weapons the CSBA estimated China can currently fire to that distance. "So if you shift instead to what the Navy's talking about doing with its air-defense capacity by shifting to shorter-range interceptors like the [Evolved Sea Sparrow missile] instead of the SM-2 in terms of loadout, adopting directed-energy weapons, using the hypervelocity projectile ... you could increase the air-defense capacity of your [carrier strike group] to the point where now you can deal with maybe 800 weapons or so in a particular salvo," Clark said. These estimates make a number of assumptions about the effectiveness of Navy air defenses and about how China deploys its weaponry. Moreover, the above scenarios end with the carrier strike group's interceptor weapons totally expended. To compensate for that and allow carriers to operate longer in contested areas, the Navy could use electromagnectic warfare to make enemy targeting harder or by attacking enemy bombers and missile launchers before they can fire, according to the CSBA report. It wouldn't be enough to eliminate China's coastal missile batteries. With China's and Russia's improving ability to fire sub-launched anti-ship cruise missiles, changes are needed to the carrier air wing's composition and operations to work at longer ranges and in contested environments, the report notes. "There is approach that could yield a carrier strike group that is, if not indestructible, but certainly defensible in an area where it could be relevant to a warfight with a country like China," Clark said at the Heritage Foundation. "This is the approach that the Navy's moving down the track toward." "A far larger number of Chinese believe it than I think is healthy," Brad Glosserman, a China expert and visiting professor at Tokyo's Tama University, told Stars and Stripes this month in regard to Lou's comments. Many Chinese believe "Americans have gone soft" and that they "no longer have an appetite for sacrifice and at the first sign of genuine trouble they will cut and run," Glosserman said. Many in the US would dispute that notion. But this was part of the discussion of the aircraft carrier's future in American power at the Heritage Foundation event on Dec. 11. There is a "heightened national aversion to risk," especially when comes aircraft carriers, according to Jerry Hendrix, a vice president at Telemus Group and retired Navy captain. Carriers have grown in cost and become regarded as a symbol of "national prestige," Hendrix said at the Heritage Foundation event. He added that in light of the importance with which carriers have been imbued, political leaders may be averse to sending them into battle. "There is, unfortunately, the heavy potential for conflict coming, but the nation is not ready for heavy battle damage to its navy and specifically not to its aircraft carriers," Hendrix said. "We need to move these assets back into the realm of being weapons and not being perceived as mystical unicorns."